The Australian Cattledog is an intelligent, high energy, versatile, fiercely loyal breed with an accommodating, affection seeking personality. Their versatility and intelligence is unmatched by any other breed I have worked with in some 45 years with dogs. They excel in obedience, agility, fly ball, search and rescue and all canine venues. Their “claim to fame” is of course herding. They have their own sense of order and like things in groups rather than scattered about. They will successfully herd cattle, sheep, goats, ducks and anything that will move including adult humans and children. Their physical beauty is rare and with many variations of red, red mottled, blue, blue mottled, silver/gray colored coats and always-dark brown almond shaped eyes. There seems to be no two dogs who are color marked alike, even the offspring rarely color match their sire and dame. Their flat, double, short coat provides excellent protection for them and allows for easy grooming. They have been referred to as the “wash-and-wear” dog because of their easy care and low grooming maintenance. Their loyal determination to be “at-your-side” at every possible opportunity has earned them the nickname of “Velcro Dog”. Their antics and behavior are charming, entertaining and interesting thus making them delightful companions who live to please their caregiver. Given their behavior described above, they can be their own worst enemy and get themselves into serious mischief given the opportunity. Consequently, they are not “the right” dog for everyone, which is the case with many of the AKC, recognized breeds. To determine if the Australian Cattledog is a dog for your family and life style, you can learn more about the breed from the following sources. The AKC Website www.akc.org and the Australian Cattledog Club of America’s Website www.acdca.org on the Internet. 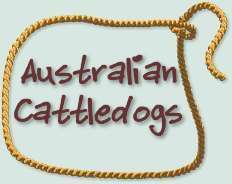 There is an excellent text entitled The Complete Australian Cattle Dog by John and Mary Holmes, published by Howell Book House which is thorough and accurate in its detail about the breed and the best written book on the breed. Australian Cattledogs, The First Five Years 1980-1985 written by Donn and Deborah Harling and printed by Sun Graphics, Inc. presents a pictorial review with pictures and pedigrees of Australia n Cattledogs. Australian Cattledogs Old Timers, an Australian book written by Cheryl Ann Edwards, printed by Fitzgerald Printing and produced by YFP Publications is a book presenting the early history and development of the Australian Cattledog in Australia from the early 1900’s to 1970. 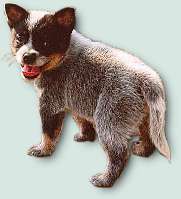 The latter two books have excellent information on the origins and bloodlines of Australian Cattledogs. These bloodlines are the foundation of Australian Cattledogs around the world. If you have questions about the breed, feel free to email TaliHO at our email address taliho@charter.net and we will be happy to answer your questions.